A row has erupted in Labour over an MP facing a vote of no confidence for “continuously criticising” its leader. 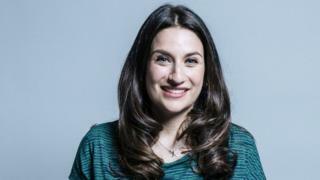 Local members have tabled the motion against Luciana Berger, who has spoken out over the party’s handling of anti-Semitism and its stance on Brexit. Shadow chancellor John McDonnell said she should reject claims she supported a “breakaway party” to show members she was “sticking with Labour”. But other Labour MPs have called his response “totally unacceptable”. Ms Berger said she would be not be “distracted from fighting for the interests of my constituents”. An extraordinary meeting has been called in the Liverpool Wavertree constituency next week to discuss two no confidence motions. In a statement, Ms Berger said she believed her constituents would judge her on her record and skills in representing them in Parliament. She reiterated her “long held view that Brexit will be a disaster for the people of Liverpool Wavertree and the wider country”, saying she would “not shy away from standing up” for her Remain-voting constituency. Former Labour leader Ed Miliband tweeted that “she should be supported not undermined by everyone throughout our party”, while prominent backbencher Yvette Cooper praised Ms Berger’s campaigning and said she had her “solidarity”. Her colleague Jess Phillips also tweeted, warning that the move “means a night of further relentless abuse, anti-Semitism and violent threats to her and her family”. Tonight while people discuss the fate of a pregnant, Jewish woman who has seen a number of people in our courts for violent racist threats, know that it means a night of further relentless abuse, anti-Semitism and violent threats to her and her family. However, speaking to BBC Radio 4’s Today programme, Mr McDonnell said the motion came about because Ms Berger is “associated” with rumours of a new centrist party being formed. “[The motion] is an expression of views,” he said. “If people are doing that because Luciana has stood up against [anti-Semitism] that is completely wrong. He condemned a Facebook post from one of the local Labour members calling Ms Berger a “disruptive Zionist”, saying it was “completely wrong”. But the shadow chancellor said: “My advice to Luciana is just tell people you are not supporting a breakaway party, you are sticking with the Labour Party, you are not jumping ship. Labour MPs have taken to Twitter to criticise Mr McDonnell’s response. Chuka Umunna tweeted: “So a victim of outrageous racism in @UKLabour must promise she will not walk because of that racism and then this can all go away. The only thing Luciana isn’t ‘clear’ about is whether she is still welcome in the Labour Party after years of antisemitic abuse. She could dance through the streets of Liverpool singing ‘Oh Jeremy Corbyn’ and she would still be on the receiving end of antisemitic abuse. Meanwhile, Labour activists from the “Another Europe is Possible” group are targeting the constituencies of MPs who broke the whip and voted with the government over Theresa May’s Brexit deal, calling it a “moment of reckoning”. Seven Labour MPs backed an amendment supported by the government calling for “alternative arrangements” to the backstop element of Mrs May’s plan – which aims to avoid a hard border returning between Northern Ireland and Ireland. And a total of 26 MPs either abstained or voted against an amendment by Yvette Cooper, that was backed by the Labour leadership, which would have allowed for an extension of Article 50 – the mechanism seeing the UK leave the EU on 29 March – by up to nine months, with the aim of avoiding a no deal. The left wing group, founded last summer, will campaign in around 30 constituencies to “apply pressure” to the MPs to vote against Mrs May’s deal.